August 26th, 2011 6:53 PM by Lehel S.
Home prices are still going down in many markets. But your property-tax bill might well be going up. Property taxes across the U.S. have increased by nearly 20% from 2005 to 2009, the most recent data available, according to an April study by the National Association of Home Builders. The median annual real-estate-tax payment was $1,917 in 2009, up from $1,614 in 2005. Over the same period, home prices in major urban centers fared badly, decreasing 31%, according to the Standard & Poor's/Case-Shiller 20-City Composite Index. Property taxes don't move in lockstep with home values because local governments typically don't measure values every year and some have limits on annual property-tax increases, says Natalia Siniavskaia, a housing-policy economist at the home-builders group. That means your current property taxes might reflect your home's value when the market was healthier. Property-tax adjustments lag behind changes in home prices by an average of three years, according to the Congressional Budget Office. There isn't much you can do about your property-tax rate, which is set by your local government. But homeowners can often get their assessment lowered if they appeal to their local assessor. That can translate into a lower tax bill. More than half of homeowners are paying too much in property taxes, says Jim Kane, Chicago-based managing director of True Partners Consulting, a tax advisory firm. One key to a successful appeal: fact-checking the assessor's work. About half of all successful appeals come from homeowners pointing out an error in the assessor's description of their home, Mr. Kane says. Such errors can drive up a home's value. To understand how these mistakes happen—and how to correct them—it is important to keep in mind how your local government assigns a value to your home. Local officials can assign a value to your home using house-by-house appraisals, computer models or even aerial photos to gauge how many rooms are in a house or whether there has been a new addition, such as a deck or swimming pool. But it's difficult to look closely at each home every year, so officials will also update home values based on recent home sales in your area. "We can be wrong," says Dusty Rhodes, elected auditor and assessor in Hamilton County, Ohio, which includes Cincinnati. That is what Lynne Weaver, a Phoenix retiree, discovered after her property-tax bill started climbing. To figure out why, she says, she went on the Maricopa County, Ariz., assessor's website and discovered that a handful of her neighbors' homes were assessed for as much as $205,000 less than her own property. Ms. Weaver says she didn't think the number was accurate because her neighbors' homes were similar to hers in construction and acreage, but had backyard pools and other amenities. Her home had "grass and flowers" in the backyard and an unfinished basement, she says. She appealed her assessment nearly half a dozen times over the course of six years before she stumbled on the problem: The assessor had incorrectly said a room used as an office was 300 square feet larger than it actually was. Armed with that knowledge, she successfully lowered her property assessment by 45% to $390,000 in 2010 from $709,715 in 2009. 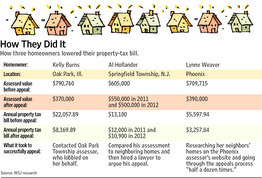 The lower assessment cut her 2010 property-tax billto $3,257 from $5,597 in 2009. Ms. Weaver, who had already been advocating for cuts to local property taxes, says the experience of appealing her own assessment galvanized her even more. She runs a group that has tried unsuccessfully to get a measure on the state ballot to cap property taxes. Paul Petersen, spokesman for the Maricopa County assessor's office, says errors of that magnitude are uncommon. But errors can happen, he says, and that's why "we expect the public to help us be more accurate" and appeal if it's warranted. About one-fourth of residential property appeals result in a lower assessment, Mr. Petersen says, adding that the county reassesses properties every year to help reflect the changing market. While Ms. Weaver fought back herself, you also can hire a tax lawyer or a property-tax consultant to do the legwork for you—if you are willing to pay up. Some parts of the country have a stronger tradition of residents appealing property assessments because of higher tax rates or more-frequent assessments. Some states reappraise property values each year, while others do it once every several years. You might want to appeal your property value after each reassessment. In Chicago, properties are assessed every three years. Residents appealed an average of one-fourth of reassessments during the past decade, according to data from the Cook County, Ill., assessor. An average of 18% of those appeals per year resulted in a decrease in the homeowner's assessed property value. Local officials say they expect appeals from property owners if it's warranted, so don't be shy. "The appeal process is part of the mass appraisal process," says Burt Manning, chief appraiser for Fulton County, Ga., which includes most of Atlanta. Most local governments allow residents roughly 10 days to 30 days to appeal their assessment after notification. To figure out the timeframe in your county or city, check your reassessment notice, which is typically sent in the mail, or call your local assessor's office. Ms. Weaver's case points to the importance of ensuring your assessor has accurately described your property. To do this, you will need to review what is called the "property record card," a summary of the characteristics of your home. Make sure there isn't an extra bedroom, say, or three bathrooms instead of two. Extra features can drive up the value of your home. You can usually find a description of your home on your assessor's website. If not, you might have to visit the assessor's office. If you have made substantial changes to your home—a refurbished basement or new marble counter tops—you might want to be a bit wary of an appeal, since it could have the unintended effect of driving your assessment even higher. But property-assessment advisers say you shouldn't be too careful. If you feel your property is being overvalued by more than a few thousand dollars, it usually is worth the effort to appeal, they say. Similarly, look closely at the assessor's description of your home to ensure that any characteristics that would drive down the value of your property—repeated flooding in your backyard, for instance, or a leaky roof that would be expensive to replace—are duly noted. The key to a successful appeal of your property value, experts say, is comparable sales, or "comps." In many states, the appeal process is like a less-formal court hearing, where property owners present their case to several local officials or representatives. The simplest way to convince officials that your property has been incorrectly valued is to provide evidence of the sales price of homes that are comparable to yours, in terms of square footage, amenities and neighborhood characteristics. Bring sale documents and photos of your property, as well as the comps. The websites of many assessors' offices include recent property sales, or you can check sales prices in your newspaper or with a local real-estate broker. Experts caution homeowners not to rely on home-value data from Zillow Inc. or other online real-estate information and search firms, since their figures aren't official and are unlikely to stand up as evidence in an appeal. For purposes of comparison, you should consider only "arm's length" sales, meaning a sale between two parties who don't know each other. A sale between two people who do know each other could result in a lower price and is unlikely to be accepted in an appeal. Check for the same last name on sales documents as a clue that a sale isn't arm's length. The appeal board also might question a home that sells quickly in a bad market, which could indicate an owner who needed to sell in a hurry. That means that sale might not work as a comp. Some property-assessment advisers say you can even use foreclosed homes, if those are the only sales in your area. Assessors choose a specific date when measuring a home's value, which might be several months before you receive your assessment notice. If your assessor set values on Oct. 1, 2010, and you are looking at home sales in June and July 2011, an appeal board is likely to reject those comps. The weak housing market means there aren't as many people selling their homes, making it difficult in some places to find comparable sales. Another option is to hire a lawyer who specializes in property-tax appeals. 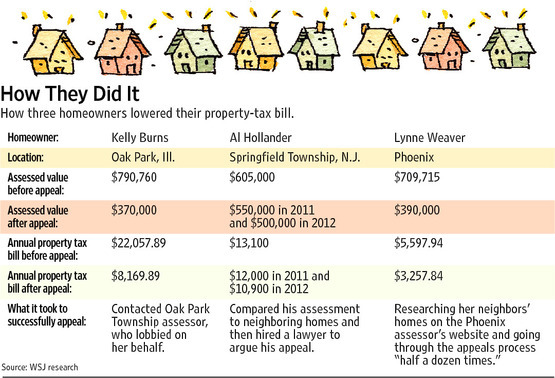 That is what Al Hollander did when he bought a house in Springfield Township, N.J., and realized that he was paying higher taxes than a nearby house that sold for about $35,000 more. Mr. Hollander bought his home for $465,000 in May 2010. It is on 1½ acres and has five bedrooms and 3½ baths. But a nearby house, which sold for about $500,000 in the summer of 2009 and is on 2.2 acres with a swimming pool, paid $1,200 less in 2009 property taxes, he says. Mr. Hollander, a physician's assistant, hired a friend who is a property-tax lawyer to lower his assessment. 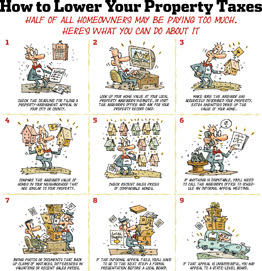 "What do I know about property taxes? I go to an expert," the 42-year-old Mr. Hollander says. The lawyer helped Mr. Hollander lower his assessment from $605,000 to $550,000 for 2011 through an informal hearing with the assessor's office. The cut reduced his 2011 property taxes to $12,000 from $13,100 in 2010. For 2012, his assessment decreased to $500,000, meaning additional tax savings of $1,100. Springfield Township officials were unable to be reached for comment. 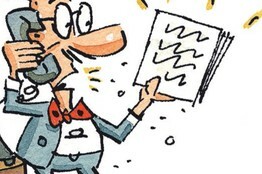 Property-tax lawyers often work on contingency and charge 30% to 50% of the tax savings for each year, says John Brusniak, president of the National Association of Property Tax Attorneys, a professional group. Those fees can differ by locality, he says. Finally, some homeowners choose to hire a property-tax consultant to do the appeal. These firms typically charge a flat, upfront property-analysis fee to determine whether they want to take your case, in addition to any filing fees. Yet some appraisal offices frown on such services. "We give you the ammunition to beat us up," says Bernardo J. Garcia, director of legal services at the Harris County Appraisal District in Texas, which includes Houston. He says his office gives people a copy of all the comparable-sales data they need to use to make an assessment. The appeals process is straightforward, he adds. Property-tax consultants say they can often get customers a better deal—and save them time spent in making court appearances. "We know all the ins and outs of the process," says Paul Henry, a principal at Tax Reduction Services in Greenport, N.Y. "The process is cumbersome and riddled with paperwork that needs to be precise, so petitions are not thrown out." Experts warn that homeowners should be cautious. "One must always be wary of scams in these areas," says Richard Roll, founder of the American Homeowners Association, a Stamford, Conn., homeowners' membership group. He recommends getting local references and checking the consultant's credentials before signing a contract. In the last three years, the Better Business Bureau has received nearly 650 complaints nationwide about property-tax consultants. More than half of the complaints involve advertising and refund problems. The assessed value of Kelly Burns's home was lowered to $370,000 from $790,760 after her appeal, and her annual property-tax bill was lowered to $8,169.89 from $22,057.89. In a chart with an earlier version of this article, two of the figures were mistakenly reversed.